NASHVILLE, TN —People Magazine’s 2017 Sexiest Man Alive, superstar Blake Shelton, has done it again. Last month he racked up his sixth win as the winningest mentor/coach on NBC’s hit talent show THE VOICE. 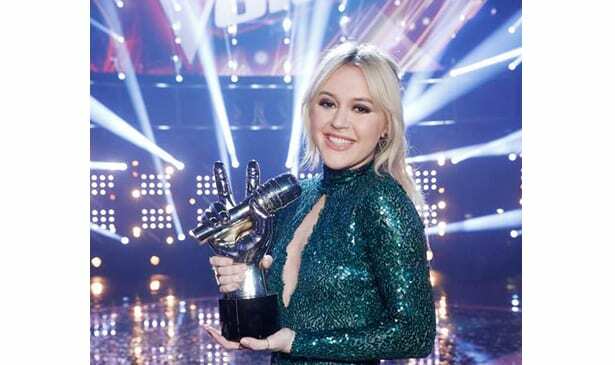 Mount Juliet’s own, Chloe Kohanski was voted the new winner for Season 13 of the popular show, with Blake serving as her coach. Chloe originally set out to become an English teacher by profession, but after about a year into her studies, music over ruled and Chloe moved to the bright lights of Nashville to become work with musician/singer Grant Smith. Together they formed the duo of Grant & Chloe. She later collaborated with local singer Mike Lowry as a featured vocalist. In total, Chloe gigged around the Nashville area for about four years before finally getting an invitation to audition in front of the casting directors of The Voice “My name kept popping up with people as being possibly ‘the next big thing’ among local singers. So, one day I got this call from The Voice casting asking me to come out to L.A. for an audition. And so I did,” recalls Chloe. A part of her Ms. Kohanski’s prizes as the winner of The Voice is winning the $100,000 grand prize and a record deal with Universal Music Group. She further said that she plans on using her music talents to bridge the genres of rock n’roll and classic rock into the world of pop culture. But before Chloe gets on that journey, she sat down to answer 5 Questions with the Tribune. TRIBUNE: I read on social media and other places there were many people who were saying early on in the competition that you were the next winner of The Voice. .Did that cause you to feel any extra pressure? CHLOE K.: Well, you know what? The entire time I was in the process of The Voice, from the very beginning, from the first blind audition, I just kind of told myself, “Okay, I’m just looking for one chair to turn. Just one chair. For somebody to believe in my voice, because it’s not typical, and it doesn’t sound like anybody else.” So, I was like, I don’t know if this is actually what I’m even supposed to be doing. I was just looking for someone to believe in me, and I really feel like I’ve accomplished that on this show, and now I have people that I don’t even know on social media saying things like that, it feels unreal. It feels amazing! TRIBUNE: What’s the coolest or most memorable advice Coach Blake Shelton gave you earlier on in the competition? CHLOE K.: He gave me so much helpful advice. But definitely after one of the rehearsals, I was asking him questions like, “What do you think about this? What do you think about this? What if I did this here?” and he was like, “Whoa, listen. You are an artist, and what you do as Chloe is unlike anything anybody else does. So, nobody else needs to be in your headspace besides you. You’re the only person that needs to be in there. And I’m not going to get involved, I’m just going to tell you what sounds good and what sounds bad.” So, when he said that, I was like, “Wow, I need to be in my own headspace, and I need to kind of be sort of myself as an artist.” He just encouraged me to be true to myself. That’s Blake Shelton in a nutshell. He’s never anything besides Blake Shelton, and he wanted me to be Chloe all the time. TRIBUNE: Lots of people are moving to Nashville. Give a pitch out as to why people to should move specifically to Mount Juliet. What’s so cool about it? CHLOE K.: If I’m being honest, I’ve lived in the Mt. Juliet area for my whole life of 23 years. Currently, right now, I live in Nashville, which is also awesome. But I encourage people, especially musicians, if you can live in town and find a good deal, it just almost creates a new atmosphere. It feels almost like California. So, I think it’s interesting – Mount Juliet offers a sense of home, and a sense of community, and it’s still kind of small-town living but not rural though. There’s definitely restaurants, and things to do, and shopping centers, restaurants etc. But it still has like the Lebanon Road, which, has been there forever. I think it’s a really homey, kind of place outside-of-the busy Nashville atmosphere.